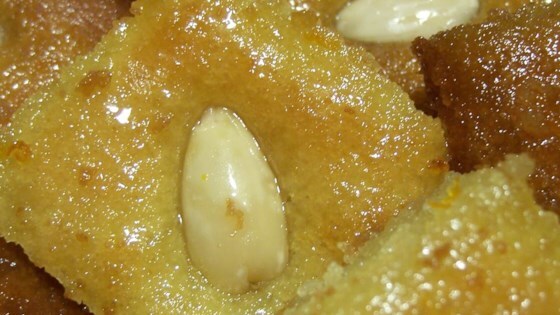 "This is a traditional Middle Eastern dessert made with semolina and yogurt, then soaked in a rose water syrup. I got this recipe from my sister-in-law." In a medium bowl, mix together the semolina flour, 1/2 cup of sugar, yogurt, oil, coconut, and baking powder. Set aside for 30 minutes. In a small saucepan over medium-high heat, stir together the water, 1 3/4 cups sugar, and rosewater. Bring to a boil, and boil for 3 or 4 minutes. Remove from heat, and set aside to cool to room temperature. Preheat the oven to 350 degrees F (175 degrees C). Spread the semolina batter into the bottom of a 9x13 inch baking pan. Slice into squares or diamonds, and place on almond half onto each piece. Bake for 20 minutes in the preheated oven, or until light brown. Switch the oven setting to broil, and broil until the top is golden, 2 to 3 minutes. Remove from the oven, and pour the syrup over the squares. Serve warm. Watch how to make this classic Russian multi-layer torte! Good, but not the same as the real one. This is the first time I try making besboosa, we normally buy it. Everyone pronounced it better than store bought! This was okay. It was extremly sweet and I couldn't really taste the rose water. I think it was over powered by the sugar.